Before I quit couponing, I used to stock up on make-up remover pads by Almay. They were pricey, but I have sensitive skin and they were the only kind that didn’t make my skin break out. 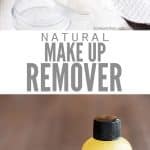 I kept up this routine until I learned I might already have a natural makeup remover in the kitchen! Wait – so you’re telling me I DON’T have to spend extra money on special products to remove my make-up? Count me in! Strangely, this epiphany happened just before I started writing my hold-your-hand book to living a more natural and non-toxic life, Kinda Crunchy. Since I was researching products for the book, I went ahead and researched the ingredients that were in the make-up remover I had been using for so long as well. According to the Environmental Working Group (EWG), the Almay Oil Free Eye Make-up Remover scored an overall 2, a “green light” rating according to their standards. That’s definitely not a bad score in general, but the data on the individual ingredients catches my attention. Um, should we be concerned about using something ON our eyes and skin that is known to be cause irritation TO our eyes and skin? Now, in the grand scheme of things, this is probably not the worst make-up remover on the market. And it’s likely not the worst offender in your bathroom either (which is one of the reasons why I didn’t include it in my book on natural living for beginners). If you rarely ever use make-up remover, I suggest a change that will have a greater impact on you. Maybe that’s attempting homemade toothpaste or a batch of homemade citronella candles instead. At the same time though, if we can ditch unnecessary chemicals – no matter how big or small – and replace them with something that’s just as effective and HEALTHY and quite likely already in our homes, then why not give it a shot? Obviously, the most natural makeup remover is the soap you use to wash your face. I use a very gentle goat milk soap that has done WONDERS for my acne-prone skin. I shared my skin story before, and if you’re in the market for a new natural soap, I cannot sing enough praises. If you’ve already got a soap that works for you, then keep on keeping on! The not-so-obvious about removing make-up is that sometimes washing your face isn’t good enough. Waterproof mascara? Smokey eye-look for a hot date? Going glam on a girls night out? I hear you. And I still see your make-up come Sunday morning. All of these natural makeup removers are essentially just one single ingredient. I have all of them only because I’ve dabbled in a myriad of DIYs and tutorials. You might not have all of them, and that’s okay! But there IS good chance you have at least one of them, and that means NOT spending more money on special make-up remover and trying to use what you already have instead. Use whatever method you have supplies for right now. If it doesn’t work for you – or if you have a reaction or allergies to some of the ingredients – then make a mental note to try another one in a few weeks. The good news is that every ingredient below can be used in something else. You’re not wasting your money on something you can only use once, crossing your fingers hoping it works. Better yet, you’re SAVING money because you no longer need to buy chemical make-up remover! Coconut oil is a healthy fat that I use often for cooking, but I also use it as a carrier oil for essential oils, a simple moisturizer when I run out of homemade tinted moisturizer OR when I’m experiencing a severe acne breakout. Because I keep a tube of coconut oil in my bathroom (either in a small 5 gram pot jar or in a leak-proof squeezable silicone tube), it’s easy to open it up and swipe some onto my eyes for a natural makeup remover before bed. I usually buy my coconut oil from either Tropical Traditions (when they have a sale and free shipping) or from Amazon, or from Costco. 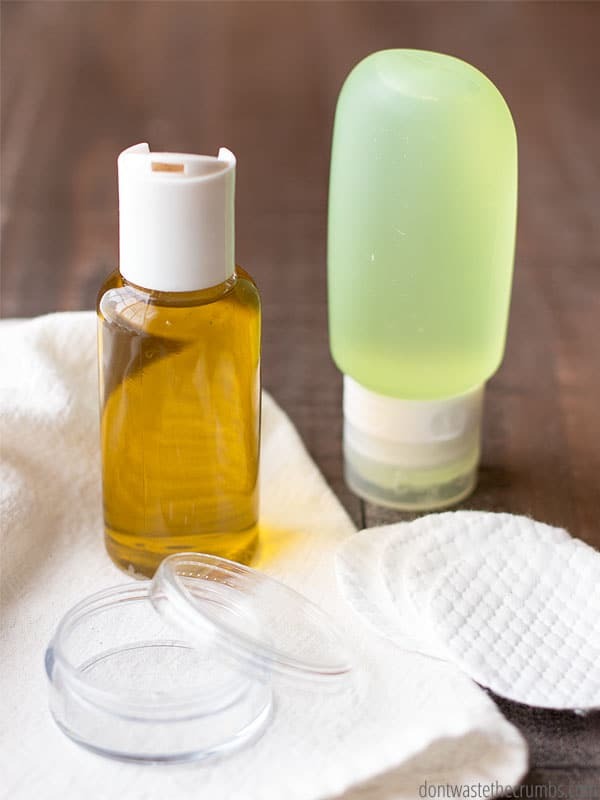 Sweet almond oil might not be as common as coconut oil, but you likely have it on hand if you make homemade shaving cream or homemade bug repellent. It’s super gentle and light on the skin, and doesn’t have much of a scent either. 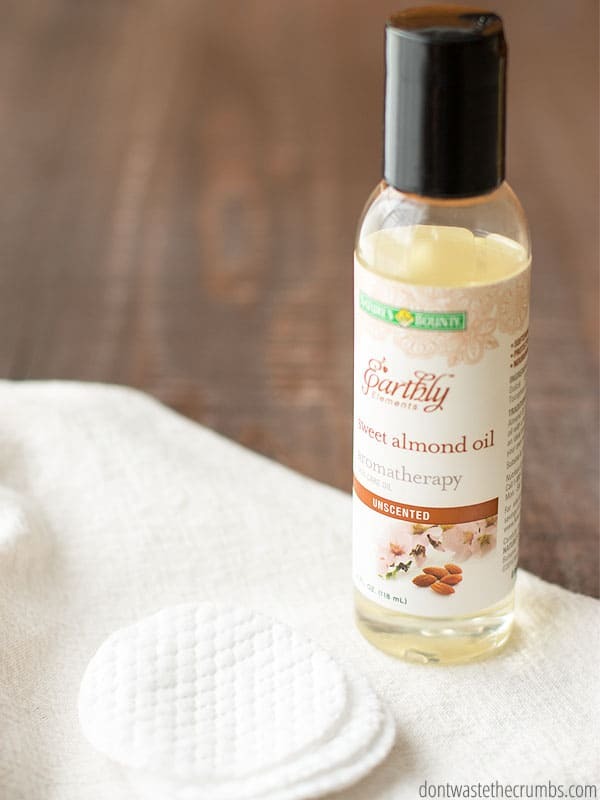 I use my fingers to apply coconut oil, but it might be easier to use a cotton ball to use sweet almond oil. You can likely find sweet almond oil locally, either at a health food store like Whole Foods or Trader Joe’s. You could even try a bigger box-store like Walmart or Target. If you can’t find it locally, you can get it on Amazon. 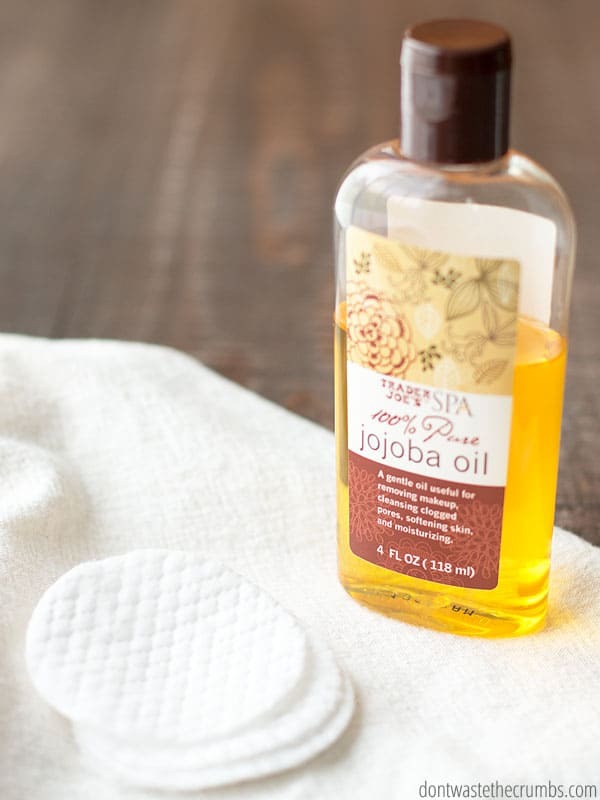 Jojoba oil is like sweet almond oil’s unpopular little sister, but it shouldn’t be! It has natural antibacterial and anti-inflammatory properties AND you already have it if you’re making homemade shampoo bars. I haven’t looked for jojoba oil recently, but the bottle I have is from Whole Foods. Make a pass through the health aisle the next time you’re at your favorite grocery and see if they have it. If all else fails, hail the awesome Amazon. The kitchen pantry is getting quite the workout in the bathroom, dontcha think? Olive oil has long been known to be a key player in the natural beauty routine. It makes an appearance in my hand-healing lotion, as well as in a detoxifying salt scrub and is likely the most affordable of the single-oil options. Use these tips for buying olive oil if you’re running low, otherwise use what you have! Another one-ingredient wonder, shea butter is reported to be able to take off even the most stubborn eye make-up. It’s solid at room temperature, so I’d suggest rubbing a pea-sized amount between your fingers to warm it up before applying. If you make lotions or cremes at home, you likely already have shea butter. I haven’t seen it at any local stores, but again Amazon has it for a fair price. Although more commonly used as a preservative in beauty DIY’s, witch hazel is a natural makeup remover too! Witch hazel is a bit thinner than the oils mentioned above, so I would definitely recommend using a cotton ball or a cotton round/square for this method. Witch hazel is fairly common, so check your local stores first. Although you should try to get an alcohol-free witch hazel if at all possible so it doesn’t dry out your skin OR burn your eyes. Ok, so I lied when I said ALL of the methods were single ingredient, but since this method is essentially a combination of the ingredients above (plus water), I’m letting it slide. This “recipe” is essentially 2 tablespoons of each ingredient measured together into a small travel bottle. Oil and water technically don’t mix, so you’ll have to shake it well before using each time. This method will also be on the thinner side, so again, reach for a cotton ball or a cotton round/square. If you’re going to travel with any of these ingredients, you MUST invest in a leak-proof container. I can also attest that the small 5 gram pot jars – although super cute and functional at home – aren’t leak proof. (Ah yes, it was a messy suitcase indeed!). I highly HIGHLY recommend using a leak-proof squeezable silicone tube when you’re traveling. They’ve proven themselves trip and trip again and I absolutely won’t travel with any other type of bottle! 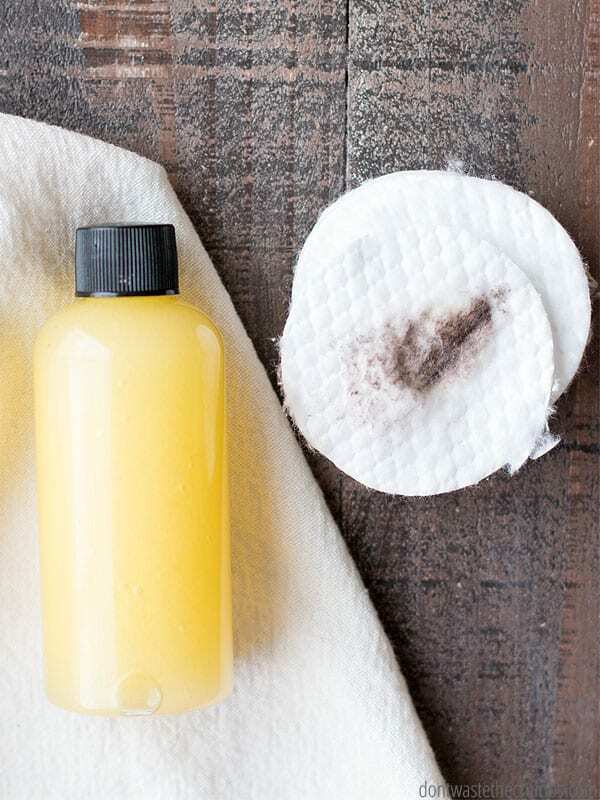 Natural Makeup Remover for the win! In addition to goat’s milk soap, coconut oil is a huge part of my natural beauty routine. I like to buy it by the gallon from Tropical Traditions. This brand on Amazon is great too. Or I find it at Costco when I’m waiting on a free shipping sale at Tropical Traditions. Sweet almond oil and jojoba oil are best priced on Amazon (here and here, respectively). Same with shea butter. I usually buy olive oil at Costco but here are some ideas on finding a good brand. This brand of witch hazel is the one I prefer. I use it in my after sun spray and homemade bug spray too. Multiple uses of ingredients makes me so happy! For traveling with your oils you can put them in these squeezable tubes or these small bottles. If you want more about the non-toxic, DIY natural living lifestyle, check out Kinda Crunchy! A hold your hand guide to a more natural life. Have you tried any of these natural makeup removers yourself? Which method do you think would work best for you? Hi Tiffany, for the past few years, I have been using equal parts of purified water, castor oil, and olive oil (2 oz. each) with great results for eye makeup removal. I have read that castor oil is rich in vitamin E, proteins and minerals, has antifungal and anti-bacterial properties, helps in the growth and strengthening of hair follicles (lashes) and is anti-inflammatory. I keep it in a flip top travel bottle, it lasts for months and is very affordable. I moistened my cotton pad first, shake bottle, put a pea size amount on and gently wipe. I love it! 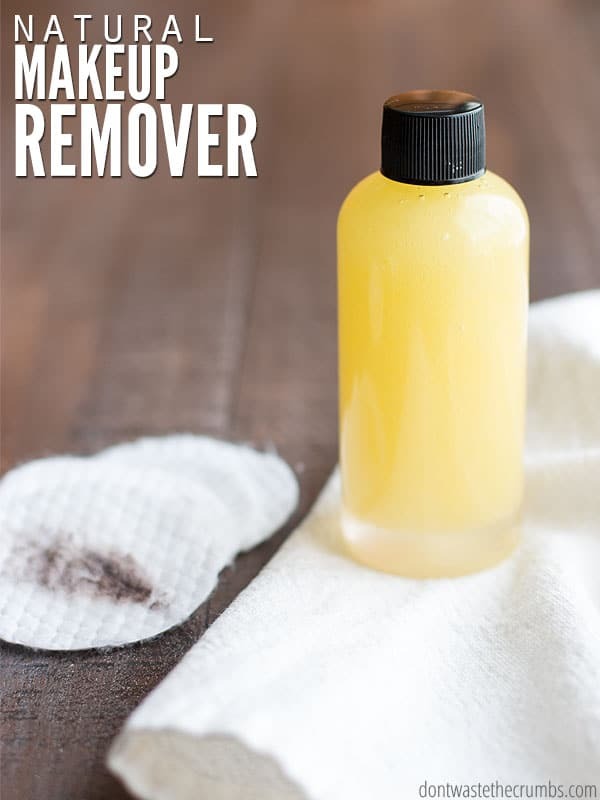 I hadn’t heard of castor oil as a make-up remover Deni – thanks for sharing! I got some castor oil for my hair and eyelashes. For the face, I mix Jojoba with Coconut oil and a few drops from essential oil (rose or neroli) for cleaning and moisturizing my face and i really like it a lot. Although i dont wear make up i find that it removes the dirt from my face and helps me a lot with acne spots! I don’t use makeup but we do have to use s lot of it for dance. Coconut oil to the rescue! I can also attest to the effectiveness of coconut oil as a makeup remover, particularly for eye makeup. And very affordable. I find it helps to get the pad wet before applying the oil – that way you don’t need as much oil. I use NORWEX cloths. I do not have to use ANY soap what so ever to wash my body or face. Removes make up without problem. Nor do I use shaving cream. Just wipe with body cloth and shave. They also sell cloths for all your household cleaning that don’t require any cleaning products. Sure simplified my life!! I use olive oil since I always have it on hand, and while it’s a great moisturizer and does the trick for most makeup, I don’t find it takes off the mascara quite as well. I’m considering trying one of the others. Hi Wendy! I’ve tried olive oil on my face before, but I wasn’t a fan. It felt too oily for me. Since my skin tends to be on the oily side, it felt like a recipe for disaster. I prefer to use coconut oil as a moisturizer and a makeup remover – which means just one tube in the bathroom serving multiple uses! By recipe do you mean witch hazel + oil + water? I’ve used this, but again ended up going back to coconut oil because of preference and convenience of not mixing up anything else. Although, this recipe is very effective. I normally don’t wear a lot of eye makeup, but this took it off without issue. If I wore a lot of makeup daily or for performances, etc., the recipe would be in my bathroom for sure! Just wanted to let you know I made your recipe & love it! I used jojoba oil, Thayer’s alcohol free (rose b/c I have very sensitive skin) witch hazel and distilled water. I use waterproof eyeliner and love makeup! I don’t wear it daily, but fairly often. I have spent a small fortune on various removers and all have irritated my eyes and skin – not your recipe though. Any chance you have a skin cleanser and moisturizer recipe? Coconut oil doesn’t really smell much at all! Hi, try the CVS one it is very soft, the price is 2 $ for 4, I use it my self. Thanks for this. Question about the coconut oil and your book. I live in Japan and at the moment it’s crazy hot, should I be keeping my organic goodies (coconut oil, olive oil, apple cider) in the fridge or doesn’t it matter? Second question, would your book apply to people globally or only in America? I’m concerned that the ingredients you would recommend wouldn’t come cheaply here in Japan. Hi Carmen! For the items you mentioned, it doesn’t matter if you keep them at room temp or in the fridge. As for the book, I’ve done my best to make sure that ingredients are available around the world, but since I’ve never been to Japan, I can’t say for sure. I read that Camellia oil was used in beauty routines in Japan (I know that doesn’t necessarily mean it’s true, but). Anyway, I bought some through Amazon and I mix some in with my moisturizer, smooth a couple of drops into the ends of my hair, add it into the hand cream I make, and mix it with a bit of castor or coconut oil as an eye makeup remover. So far, I’m loving it. My skin looks good and I get compliments on my shiny hair. I’m still working on my eye makeup remover and I’m going to try some with the water and witch hazel and see if I like it better. What I’m using works but not as quickly as I’d like. A recent skin issue prompted me to look for a quality facial cleanser with only natural ingredients (no chemicals). I went with the Made from Earth Green Tea Cleanser because it removes makeup (including eye) without irritating my eyes. My face is clean and smooth, no taunt feeling. As stated, only a small amount of cleanser is required. The scent is fresh, spa like botanical. Yes ma’am, I use green tea as a cleanser, toner and makeup remover! It works great and my skin feels clean and well fresh. I can feel that my skin is getting healthy cleansing! Thanks for sharing. I have heard coconut oil is good for hair and eyelashes. It makes your hair healthy, sleek, and stimulates hair growth. But coconut oil is really makeup remover. what about using rosehip oil? does anyone know if it removes makup. I’m 62 so I have mature skin. Thank you for the information! I can’t wait to make my own. You had stated you found out what the ingredients in your Almay makeup remover pads were rated. How did you find that information? I would love to check on some of the things I’m currently using. Thank you so much! If I decided to use Coconut Oil, which I love to remove eye up, what would be the exact proportions? And what about for hair health anc growth. I’m oldered and my hair is dry from coloring, hair dryer etc. Thanks so much. Hi Tiffany are you all aware that coconut oil is one of the highest ratings for clogging pores. You don’t want this anywhere near your eye glands. My Ayurvedic doctor recommends sweet almond oil or Argan oil. The latter does not clog pores. I also use castor oil which is a natural antibiotic. It makes lashes grow lustrous. Hi Yvonne! I personally have never had an issue with coconut oil clogging pores, and found that argan oil caused me to break out! Published ratings are helpful, but I suggest trying something for yourself to see what works best. We’re all created differently and will therefore have different reactions! Wow. I was completely blown away after reading this, and then I tried it. I started with coconut oil and could not believe how easy my eye makeup came off! I’m going to try the others just to see which works best for me, but yay! No more having to buy eye makeup remover!